In order for an image to appear on the web as "floating", it must have a transparent background before it is loaded into your webpage! Choose a .gif image. If the image does not already have a transparent background, you must use a photo editor to identify or create a the transparent background. If the image has a transparent background, you can skip this explanation and go to step 3. Yellow was chosen as transparency color here, but there were several shades of yellow so the background did not fade out on the webpage! Choose a unique color that does not match any color the image unless you are purposely trying to eliminate that color from the image. 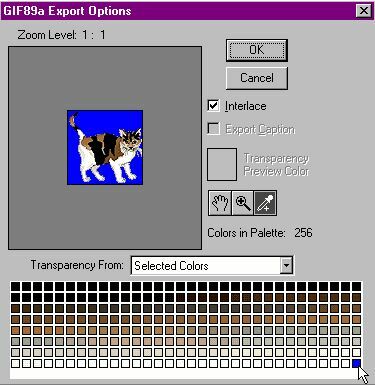 Black was chosen as transparency color here, but there was black used in the cat so too much faded out on the webpage! 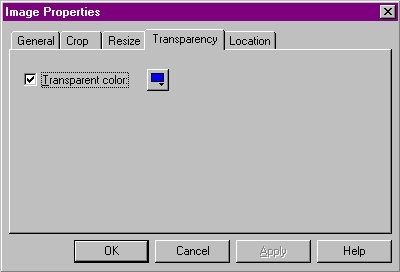 You must define the transparent color in your photo program and save the file. Though the process is essentially the same, each program has it's own way of doing it. Check your HELP file in your photo editor for specifics. The background often changes to signify transparency. 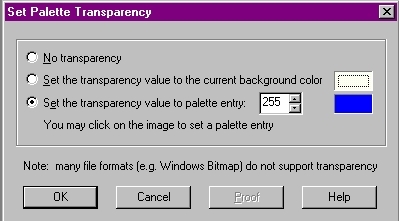 In Paint Shop Pro, from the Color menu, choose 'View Pallet Transparency'. This "blocked background" is used by Paint Shop Pro for transparent images. Save your image in the transparent mode! Insert your image into CSB/Trellix webpage. If you have CSB4, and just put the image into the file, you are already done because there is no Transparency tab for newly inserted images. Right click the image for menu, Choose Properties>Image. This check box is only functional on images already set to transparent before inserting into CSB3/Trellix. Consider it a toggle switch solid/transparent. The same image of the cat is used in the solid and transparent samples below! SOLID: If the check box is left unchecked, the background of the image will show your background color, even though you defined the image in your photo program as transparent! TRANSPARENT: If the check box is checked, the background of the image will be transparent when you publish!